The Deutsche Bucht or the German Bight is also sometimes known as the German Bay and is situated in the southeastern bight of the North Sea. This bight is bordered by Germany and the Netherlands in the south, towards its east one can find the borders of Denmark and Germany which together they form the Jutland peninsula. On the other hand, towards the north and western side of the bight, its limits are created by the Dogger Bank. Deutsche Bucht also contains within itself the Frisian and Danish Islands. At this location, one can find the 10 to 12-kilometre spread of the Wadden Sea. Collectively, the Frisian island group is known as Frisia. There is also the Heligoland Bight, it is the name given to the southern portion of the German Bight. Within the studies associated with geography, a bight has been classified as a certain bend or a curve that appears in a coast or a bay which is more often than not slightly receding. The main distinguishing characteristic feature of a bight from a sound is that a bight is shallower. Whereas a sound is typically larger than a bay and much deeper than a bight and is wider when compared with a fjord or a narrow sea or channel of an ocean which flows between two water bodies. Traditionally speaking, explorers have been defining a bight in terms of a bay through which one could sail out on a single tack in a square-rigged sailing vessel irrespective of the direction in which the wind is blowing. The apex of the bight has been categorised to be less than 25 degrees from the very edges. The Jutland peninsula: Towards the southern side of the peninsula one can find the German Bundesland of Schleswig-Holstein. There are two sections of the Schleswig-Holstein, namely, the Danish fief or the former Duchies of Schleswig and the German fief or Holstein. Throughout history both these regions have oscillated between Denmark and Germany. One of the last accounts of this dispute was settled in 1920 when the Schleswig Plebiscites were reached. As per this document, Denmark would administer the Northern Schleswig. The southern border of the Jutland is formed by the river Eider which also forms a natural border between Schleswig and Holstein at the same time naturalising the borders between Denmark and Germany. Battle of Dogger Bank: It was an important battle which was fought in the year 1696 during the Nine Years’ War. The Grand Alliance lost at the hands of the French fleet which was under the command of Jean Bart. Battle of Dogger Bank: The site witnessed another round of violence in the year 1781, this time during the War of American Independence. On the on 5 August 1781 one of the squadrons of the Royal Navy went one on one with the Dutch squadrons. Dogger Bank incident: On the 21st of October 1904 at the time of the Russo-Japanese War one of the Russian naval ships mistakenly open fired a British fishing boat. The Russian ship crew took the fishing boat as a torpedo boat. Battle of Dogger Bank: The Battle of Dogger Bank was fought in the year 1916 while the First World War was culminating. This time, it was fought between the Royal Navy and the German High Seas Fleet. The German submarine incident: This incident is considered to be one of the worst peacetime incidents when a German Type XXIII submarine, U-Hai sunk. Reportedly only one of the 20 men crew survived. Frisia: Along the south-eastern corner of the North Sea you will be able to locate Frisia or the Friesland. The larger section of this region is under the control of the Netherlands and the remaining smaller section is under the control of Germany. Indigenous population residing here is of German descent but they speak a language which is known as Frisian. This language draws close associations with the English language. The region has changed dramatically over the past few years. It has had quite a journey moreover, the modern times here have been largely marked by various forms of freedom movements. These islands have a unique formation from east to west, sometimes resembling like a tiara. Also, furthermore, the various islands that comprise this archipelago are as follows: Wangerooge, Spiekeroog, Langeoog, Baltrum, Norderney, Juist and Borkum. Together, they form a distinct constellation which serves as a modern day paradise. It further provides you with endless sandy beaches and the view of the vast expanses of the sea. The peak season begins from the middle of May and goes all the way to September. Tourists love to explore the beauty of the main island along with the towns which are located in Nordseebad Borkum and Norderney. In these regions, you can find numerous resorts. 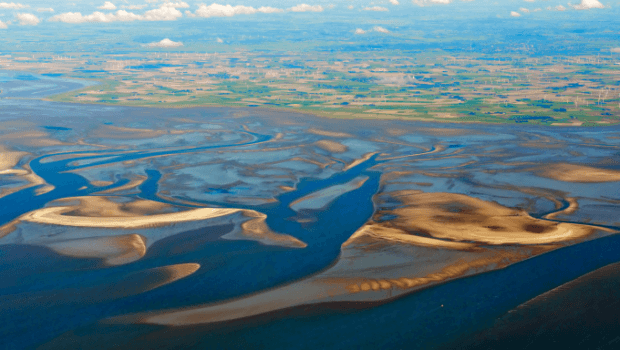 Wadden Sea: It is one of a kind, the principal continuous arrangement of intertidal sand and mud flats in the whole wide world. The Wadden Sea is also divided between the Dutch and the Germans, and both these sites are protected. The region features large expanses of wetlands which provide habitation to a large variety of maritime flora and fauna. People usually flock here to see the harbour seal, grey seal and harbour porpoise. It is a unique conservation destination which features in the UNESCO World Heritage Site.